I am working on a self-drive itinerary for a Belgian family of 5 (the 3 children are all girls, aged 10 11 and 12) visiting SA this April. They would like to include snorkelling (the dad has snorkelled Red Sea; for the kids it would be the first time) at either Kosi Bay (mouth? ), Sodwana Bay or Cape Vidal. Do you operate in these areas and which would be the best for snorkelling? Please advise your clients that South Africa is not a snorkel destination. If the dad has done the Red Sea, they will be bitterly disappointed by the snorkelling in SA, be it Kosi, Vidal, or Sodwana. Most of our reefs are quite far off shore, and are deep, 10 meters plus, with viz on a good day at 10 meters. So, if you are snorkelling on the surface, you can barely see the reef, let alone sea life on the reef. Places like Sodwana do offer snorkelling but it’s from the shore and only a peak high and low tide, when there is no current. Wilma, I really wouldn’t recommend it. They will be disappointed. 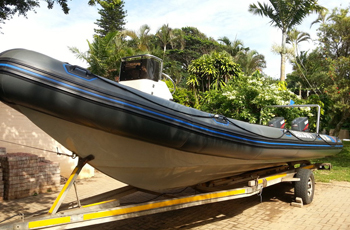 What type of boats do you use when diving in South Arica or Mozambique? That all depends on the type of diving you are doing. All Great White cage diving whether in Gansbaai, Mossel Bay or Simon’s Town we use rigid hull 36 ft. catamaran that accommodate 18 divers + 4 crew and a 30 ft. catamaran that accommodates 9 divers + 3 crew. For all other diving in South Africa and Mozambique, we use 8 or 9 meter “Rubber Duck’s” as they are locally, affectionately called, otherwise known at Semi-inflatables or RIB’s. 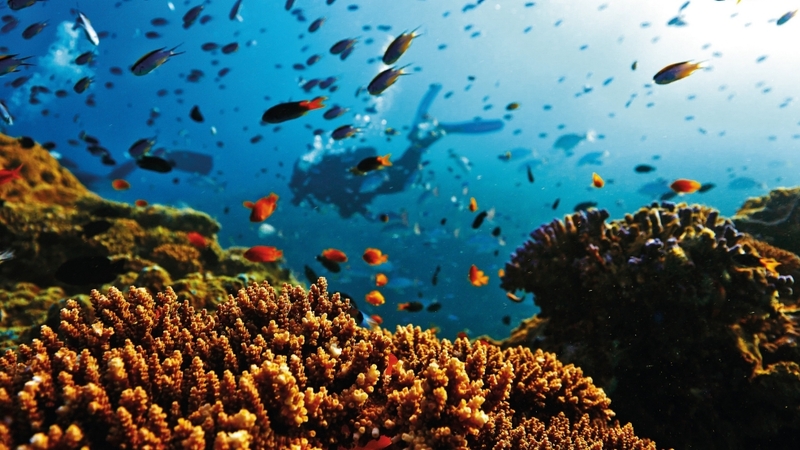 Is June a good time of year to dive Mozambique? June is a magic time to dive off the Bazaruto Archipelago. Its winter in the tropics, the dry season, therefore there is no run off from the rivers making for excellent viz. Where is Barra Lodge, close to Inhambane, in relation to Tofo, also close to Inhambane, in Mozambique? Barra Lodge is right next door to Tofo. Tofo is a town, Barra is a dive resort. You can walk from Barra to Tofo along the beach. It’s a walk of about 2 hours. When staying at Barra or a B&B in Tofo you all dive the same reefs. When diving the reefs of the Bazaruto Archipelago are there just the 2 dives you can do due to the tides? If so, are they in the morning? Could you please advise on what is the absolutely best time to dive Mocambique (north and south)? Where we dive mostly, Barra and Tofo, our diving is year round; different times of year can offer us different sights, above water and below. Because Mozambique is in the southern hemisphere, our summer is from December to February and our winter is July to September, though because we are not too far from the equator our winters are not extremely cold. From December 15th until January 15th it is the South African school holidays and because Mozambique is close to South Africa, all seaside resorts tend to be quite busy during this time, so if you would like to come and visit us during this period, you need to book early! It can get very hot during this time (temperatures can get up to 40 ˚C) and quite humid. Water temp: 27 ˚C-29 ˚C. From June until September: The whales are here, it’s sunny and warm during the day, and the evenings are cool enough to wear long sleeves. If you come in late June, it is possible to see both the humpback whales and the whale sharks! Water temp: 20-25˚C. This is however the main windy season so be prepared for some choppy sea conditions. From September until December 15th: It’s starting to get a little warmer at night, the dive resorts varies between very busy and not busy, though these times are unpredictable, so book early or check with us.The water temperature is rising steadily from 23-27˚C. Visibility, wind and sea conditions: You will need to remember that this is Africa! It is impossible to compare our conditions to other parts of the world. The sea conditions can range from lake-like to very rough with swells sometimes reaching over 5 meters and wind speeds up to 30 knots. We will not launch our boats and take you diving if the sea conditions are too rough (decided by our experienced dive and boat staff) or unsafe. You will find, that if you have never dived here, or along the south-eastern coast of Africa, that the conditions can be quite challenging one day, and very easy the next. Visibility can range from 1 meter to 30 meters and none of the conditions are predictable. We can also get very strong currents on our deeper dives and this is why all our deep dives are considered drift dives and done with negative descents. Having said all the above, we can also experience very calm and pleasant sea and diving conditions. Where do you do your Great White cage diving? Must I be certified diver to be able to get into the Cage? Strictly speaking, in order to get into the cage on scuba you have to be a certified diver, but nothing prevents you getting into the cage with a snorkel. If the dive master is satisfied that you are OK on scuba even though you aren't certified he "may" allow you in the cage using scuba. But believe me, sometimes the action viewed from the deck of the boat is as impressive as being viewed from the cage! How much time can you spend in the cage? As for the amount of time you are able to spend in the cage - this again depends on a number of factors. The main factor being the number of divers on the boat. Most boats accommodate 10 people max, but not are all divers as some come along to surface view only. Obviously the more divers the more people there are who want to view the sharks from within the cage. The dive master will then limit the amount of time each diver has in the cage until all divers have been in the cage and seen the sharks. Thereafter it's up to the divers on board as to who is next in the cage and again, depending on how many divers are standing in line for a second shot, depends on how much time you can spend in the cage. You should also remember that there are times when it's impossible to get into the cage due to the roughness of the water. In such instances, even if you could get into the cage it would be like being in a tumble dryer and you wouldn't see a thing. Hi! Can you send me info on shark cage diving? South Africa is reputed as having some of the healthiest shark populations in the world. We were the first country in the world to protect the Great White Shark and this was done as an act of parliament way back in 1991 and since then lots has been done to protect the sharks off our coast. But having a 3 000 kilometre coastline it’s not a simple task but never the less we are blessed with an enormous number of shark species. And for this reason, South Africa must rank as one of the top spots in the world to view and swim with sharks. As explained above, we have a 3 000-kilometre coastline and the sharks are found all along this coast. Some sharks favour the colder waters of the Cape, like the Great White, others favour the more warmer waters just south of Durban, like the Sand Tiger, Bull, Tiger and Hammerhead Sharks and then the massive Whale Sharks prefer the warm, tropical waters off the coast of Mozambique. In order to be able to dive with sharks you have to be prepared to travel, from Cape Town to Durban to Inhambane in Mozambique, and to give you an idea of distances, from Cape Town to Durban is the same distance as from London to Istanbul, a two-hour flight by Boeing. Then from Durban to Inhambane as about the same!! Then there are the seasons as well. Some sharks are more active during our summer months (October through March) whilst others are more active in our winter months (April through September). In order to simplify things we have prepared the link to our "Big 8" Shark Timetable" as a guide. But because sharks can't read, they don't always abide by this timetable so this is purely a guide for us mortals! 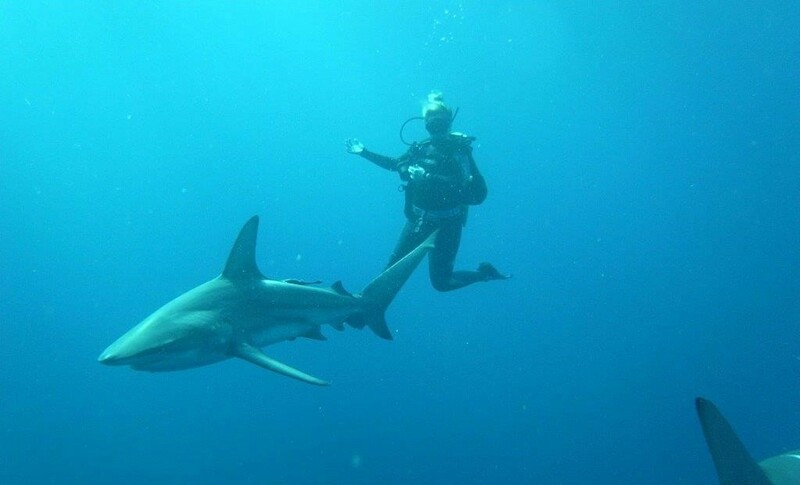 https://www.divethebig5.co.za//shark-diving/timetable.html Our suggestion to people wanting to dive with sharks is that you pick the species that you most want to dive with, look at the "Big 8" Shark Timetable and plan your trip around that based on the time you have available to spend in South Africa / Mozambique. As for levels of certification? When diving Great White's you don't need to be certified at all as this can be done on snorkel. If you want to dive with Sand Tiger, Bull, Tiger, Copper and Hammerheads at Protea Banks you need to be an advanced diver, Open Water 2 or have 25 logged sea dives within the past 12 months due to the depth of the dive (in excess of 30 meters) and the strong currents that are normally found on Protea Banks. To dive with the Sand Tigers and Tiger Sharks at Aliwal Shoal you just need to be a certified scuba diver, certified by a recognised agency such as PADI, NAUI, CMAS, SSI, BSAC etc. To dive with the Whale Sharks, this is best done on snorkel, as the exhaust bubbles from the regulator tend to frighten the Whale Sharks away. So there you have it! It's not that easy I'm afraid. You need to decide which species you want to dive with, at what time of the year, how much time you have available and budget as getting around South Africa and Mozambique by air and road is expensive these days, what with the price of fuel and all. If we can be of any assistance in putting your shark diving package together, please don't hesitate to contact us. Forgot to ask you...the breaching...generally how far is the decoy towed at the back of the boat? Thought of borrowing a nice camera to take pictures too. About 30 meters max, but the crew spot the shark approaching the decoy a long time before it’s on the decoy, they do this daily and know where and what to look for, and as soon as they spot the shark approaching the decoy they start reeling the decoy in, and try to get the shark to breach as close to the boat as possible. A good lens 70/300 should be enough. In any case we have a white shark excursion for 1 pax for 15th sep, just one question which is the price for a non diver on board? 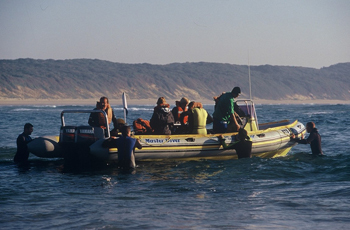 As for a non-diver going on a White Shark Excursion, they pay the same price as a diver, simply because they occupy a space on the boat, (limited space on the boat), that could be taken up by a diver. I have a crazy friend who is coming to Cape Town in October and wants to do open water shark diving, not in a cage. Do you offer such, if not, do you know who does? Please tell your crazy friend that not everybody has a death wish, and our authorities do not condone assisted suicide. 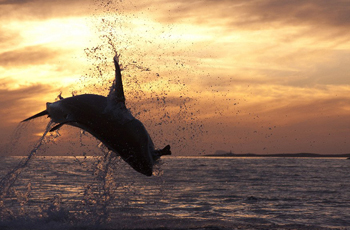 Great White diving without a cage is not allowed in South Africa. Seriously, the only way in which to attract a Great White to the boat is to chum. Decanting mashed sardine and fish oil into the ocean. 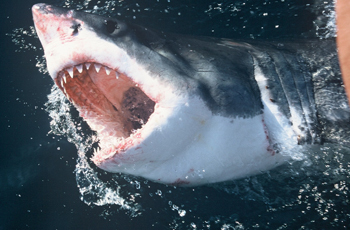 The Great Whites sensory organs are so acute that they can pick up 1 particle of blood in 1 000 000 particles of water. Once we are successful in attracting the shark to the boat, we put out a piece of “bait” to hold the sharks attention, and once we have the sharks attention, we slowly drag the “bait” towards the boat, and towards the divers in the cage, which is attached to the side of the boat. In short, we create a feeding frenzy! 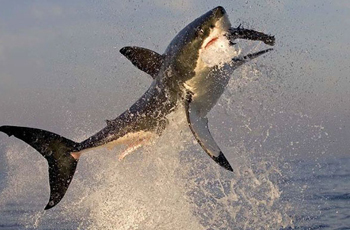 The shark cannot differentiate a “bunny hugger shark diver” from a tuna, both of which are a meal to The Great White. Please be assured “you don’t want to be in the water with a great White on a feeding frenzy.” Pure suicide, and painless, so I’m told. 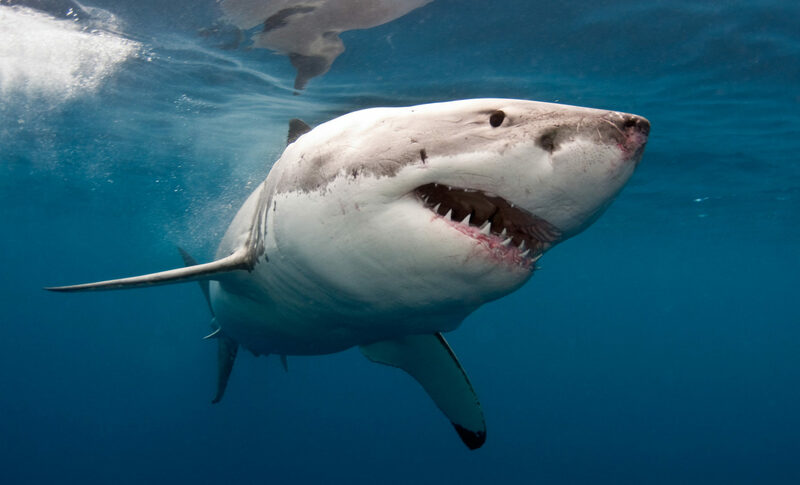 Great White Shark diving is so strictly controlled in South Africa to the point that you may not use mammal blood as chum, only mashed sardines and fish. Also, it is forbidden to use mammal meat such as whale or seal meat as “bait”. http://www.divethebig5.com/shark-diving/shark-diving/the-bait-debate.html Hope this answers your question, and we look forward to getting your “crazy friend” wet when he comes to South Africa. Please be reminded, assisted suicide is illegal in SA. Do you guys think there is any evidence that the contrast in colour poses any risk diving with sharks? Let me know because the customers just want to know if they need to buy different fins for this trip. I don’t want them to spend money and then turn up to find the dive center has yellow rental fins! The question is not a strange one at all, especially from divers who are not used to diving with animals capable of inflicting grievous bodily harm / injury, or even eating them alive!! I have the same people here. On my dive today was a guy in a yellow wetsuit - he is still alive!!! Personally I would not buy new fins. Worst case scenario, we can lend them some fins if they feel strongly about it. lol. yes yum yum yellow. The sharks are more interested in yellow, white and silver fins. We have never had an issue but if the diver is a bit more nervous of sharks coming close them another choice could be better. Some of our rentals fins are yellow...lol. Really, I would not worry! 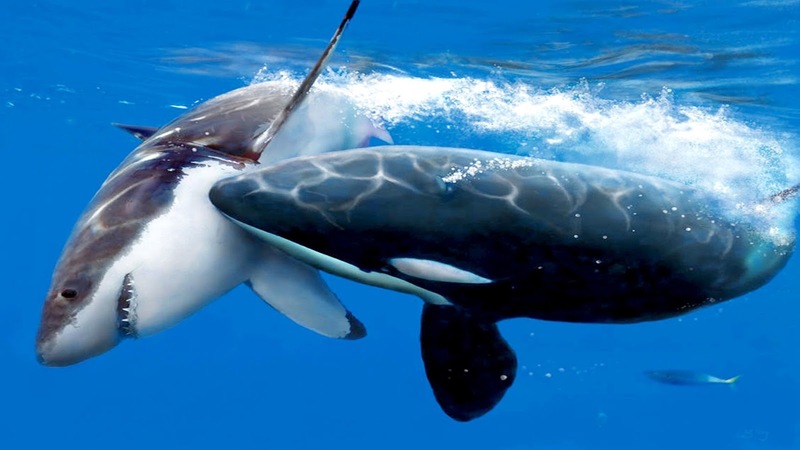 What if the sharks are not there in August because of the orca's? Do we get our money back then? I would like to hear before we decide. Is that possible? I wish that my crystal balls capabilities extended to the following minute, let alone till August!! If that were true I would have retired years ago and be on an island in the Quirimbas Archipelago diving……. diving……. diving. What I can tell you is that the Orcas have left the area, both Gansbaai and Simon’s Town, and the White Shark activity has returned to “normal.” Whatever “normal” is in Mother Nature’s terms. Henske, from the above, I guess you can read in between the lines and note that when dealing with Nature, nothing is guaranteed. For your further information, following is our cancellation policy:- Dive Cancellation Policy. Full refund in the event of the dive being cancelled due to bad weather. Should the weather forecast be favourable, and on arrival at the dive shop in Kleinbaai / Simon’s Town, the dive is cancelled by the skipper of the dive boat, due to weather conditions, a full refund on the dive, but no refund on the transfer fees, if applicable. Should we launch the dive boat for the dive, and during the course of the dive the skipper decides to return to shore due to unfavourable sea and weather conditions, there will be no refund. The skipper’s decision is final and is based purely on diver safety and comfort. We have a 95-98% sighting success rate through the year, however, please bear in mind that sightings of wild animals can never be guaranteed. In the unfortunate event that you do not have shark sightings during your trip , we will provide you with a voucher, (valid for two years), allowing you to join us on another trip, free of charge, on a date of your choice, subject to space availability on the boat. I am traveling to cape town the first two weeks of January. My dream has always been to dive with great whites. I am a qualified Dive master and looking for a more private experience. I will be visiting cape town with 6 others. out of the the 6 people 3 have diving experience and would also like to go. my question is i understand the factors that are out of your control ie. weather, shark activity. We only have one day January 9th to do this. I'm praying for the right conditions. any information would be appreciated. I would like a private adventure for 7 people total. 4 divers.. Many thanks for spending time on Dive The Big 5’s Great White Shark Webpage, and for taking the time and effort to submit your question. Having been on our Website you might have noticed that January month must be the worst time to cage dive with the Great Whites. From the end of October, after the Cape Fur Seals pup, till mid-March, is “closed season” for the Great White’s. They predate mainly on seals, and during the pupping season there is just so much food about that they simply gorge themselves full. 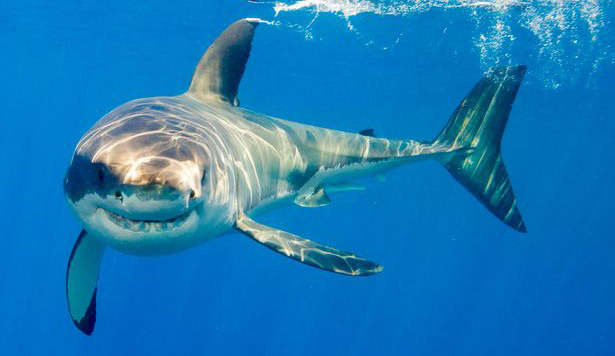 The Great White stores its energy in its liver, which can weigh as much at 60% of its total body weight. With a result they are not hungry and not interested in hunting its prey, which is the seal. They are in the area, but are very lethargic and lazy, so sighting are poor, and are fleeting. So much so that we cease our Great White shark operations out of False Bay, off Simon’s Town, but we still operate out of Gansbaai. So, having said all that, if you are still interested, we can book you and your group on Tuesday, January 09, 2018. The cost is ZAR 1 980 per person, diver or non-diver, excluding transfers from a central location in downtown Cape Town / Gansbaai, return. If you require transport from a central location in downtown Cape Town to Gansbaai, return, the cost is ZAR 2 380 per person, diver or non-diver. Our boat is licenced to take 36 people, but we limit the numbers to 20 clients and 5 crew, thereby enabling us to provide our clients with more comfort and space, as well as a more intimate experience. If you would like an exclusive charter, the cost is ZAR 32 670 for the dive boat, excluding transfers from Cape Town to Gansbaai, return. If you should require transfers, please add ZAR 400 per person to this amount. Chuck, I think I’ve given you all the basic information about a Great White Shark cage diving trip. If you would like to take a chance, and if you have any further questions, please don’t hesitate to ask. I’m afraid that there is no Shark Cage Diving on Protea Banks / Shelly Beach. Protea Banks Protea Banks is a world renowned Shark diving destination, and all Shark diving on Protea is either a “baited” Shark dive The Bait Debate> or a Protea deep reef dive. On a “Baited” Shark dive, you need to be a certified Scuba Diver if you want to dive on Scuba gear. Non-certified divers can do this activity on snorkel, mask, and fins, and watch the Sharks and Scuba Dives from the surface. This is not cage diving per se. 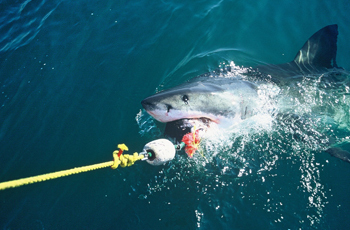 The only “real” cage diving that takes place in South Africa is Great White Shark cage diving and this activity takes place off Gansbaai and Simon’s Town, both close to Cape Town. When Is Mako & Blue Shark season? The best months are October through July. 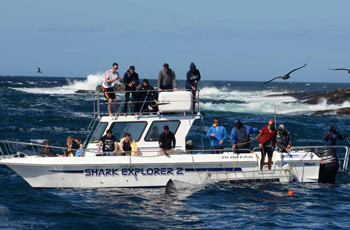 This is a full day expedition, departing Simon’s Town Pier at about 08h30 and returning at 16h00, depending on shark activity and weather conditions. Blue and Mako Sharks are deep water predators and are found in the waters 30 to 50 km’s south of Cape Point where no land is visible. Once the sharks have been located the chum is decanted into the water to catch the sharks attention and a bait box full of mashed sardines is lowered to about 10 meters to hold the sharks attention. You then have the choice of “free diving” on snorkel with the sharks, or kitting up on scuba and diving with the sharks – your choice. Once every diver has had their fill of diving with the deep water predators, the Blue and Mako Sharks, you will return to Simon’s Town Harbour. Is chumming the right thing to do to attract sharks? What time of year for the shark dives? Many thanks for spending time on our Dive The Big 5 website and for asking your question “What time of year for the shark dives”. South Africa is fortunate in having a very health shark population. Great White Sharks have been declared a “protected species” since the 1969, and catching all other species strictly monitored. 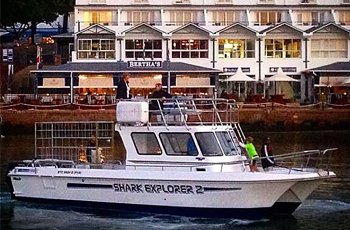 If you go to the following link on our website http://www.divethebig5.com/shark-diving/timetable.html You will see from this “timetable” what sharks are where, and at what times of the year. Please note that the Sharks have not read this “timetable”, so they don’t know where they are supposed to be, and when. Can you advise of how many dives will be undertaken on a typical day during the Sardine run? We launch the boat every day at about 06h30 in the hope of being in the middle of a shoal of Sardines, with even higher hopes of being on a bait ball, along with all the other sea creatures, so there is never a dull moment. If you do happen upon a shoal, you stay with it as long as possible, if not, you are up and down the coast all day looking for the action. You will return to shore at about 15h00 or when everyone on board the boat “has had enough”, and then we try again tomorrow. But our main and sole objective is to find the shoals of Sardines. Was interested in the sardine run trip at the end of June. How much diving experience is necessary to be able to do this? I'm certified with an advanced PADI certificate and been on 16 dives is this enough? The Sardine Run is not for the light hearted, and some general requirements are needed to ensure a safe and enjoyable expedition. •General Health. To participate in the Sardine Run, potential explorers should have a clean bill of health and a reasonably good level of fitness. 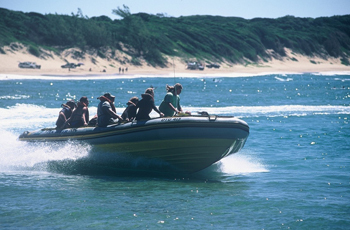 Whilst Dive The Big 5 dive boats have stepladders, spending upward of 5 hours at sea daily and clambering on and off inflatables is physically demanding. •SCUBA qualification (optional). Most guests enjoy the Sardine Run immensely whilst snorkelling. However, if you wish to go on SCUBA, then a minimum of an open water certification is required. •For Snorkelers. To be eligible to accompany Dive The Big 5 as a snorkeler, guests must be competent in the water and have a basic knowledge of using a mask, snorkel and fins. •Sea sickness. Dive The Big 5 cannot return to land if a guest is feeling seasick. Thus if any guests are prone to seasickness we insist that precautionary measures be taken prior to venturing to sea. Otherwise, it may turn into a very long day. I would like to do the Sardine Run, but I am not a certified diver. Can I still join a Sardine Run as a non-diver? The Sardine Run is not for the light hearted, and some general requirements are needed, to ensure a safe and enjoyable expedition. •General Health. To participate in the Sardine Run, potential explorers should have a clean bill of health and a reasonably good level of fitness. Not all Dive The Big 5 vessels have stepladders, and spending upward of 5 hours at sea daily and clambering on and off inflatables is physically demanding. •SCUBA qualification (optional). Most guests enjoy the Sardine Run immensely whilst snorkelling. However, if you wish to SCUBA dive, then a minimum of an open water certification is required. •For Snorkeler’s. To be eligible to accompany Dive The Big 5 as a snorkeler, guests must be competent in the water and have a basic knowledge of using a mask, snorkel and fins. If there's no sardine run, do people snorkel? If so, what animals can they expect to see and swim with? As I’ve said, there is the possibility that the Sardines don’t show up on cue, and the main reason for this is that the water temperatures don’t drop below 19º C. In this case, the Sardines stay far out at sea where the waters are colder or they stay deep. The upside is that all the sea predators are in exactly the “same boat” as you are in. They know as much as you, so all along the entire 1 600 km stretch of coast where they are likely to appear, there are literally thousands of dolphin, whales, sharks, gannets, seagulls, seals, penguins – you name it – all waiting for the arrival of the Sardines. The tell-tail signs that there are Sardines are the sea birds, especially the Cape Gannet. They usually sit quietly on the water waiting patiently. As soon at the Gannets spot a shoal, and they are always the first to do so, they fly into the air and start dive-bombing the shoal. There are literally thousands and thousands of Gannets. It’s a sure giveaway that there are Sardines. The skipper then moves the boat directly above the shoal of Sardines and the fun begins. On the Sardine Run Is it better to dive on snorkel or full scuba gear? The choice is then yours. Do you go in quick with mask, fins and snorkel or do you kit up into full scuba gear and drop down to about 10 / 15 meters and watch the action from below. Remember, the shoal is constantly on the move, so sometimes it’s best just to don fins, mask and snorkel and get onto the action ASAP. If the skipper and DM are of the opinion that the shoal will be around for a while, or if the predators break the shoal up into a smaller “bait-ball” then get into your scuba gear. But the skipper in conjunction with the DM will advise you what’s best. Is it possible to bring my own dry suit? You don’t want to be in a dry suit when on the Sardine Run. The dive boats we use are “Rubber Ducks”, Zodiacs or RIB’s. We launch at about 07h00 and stay out at sea almost the whole day. Until about 15h00, depending on the action. I really don’t think you want to be in a dry suit for 8 hours with no place on the boat to change in and out of the dry suit. Water temperatures will be about 19°C so we suggest 5mm wet suits. When there is no action, you strip the wet suit to the waist and wear a fleecy lined windbreaker on top. When there is action, you pull on the wetsuit, put on your mask, fins and snorkel and bail overboard to view whatever action there is. If the skipper and DM are of the opinion that the shoal and action will hang around a bit, i.e. form a bait-ball, they will advise you to don full scuba gear and drop down to about 10 meters to be part of it! A dry suit is the most impractical suit to bring on the Sardine Run. All dive gear is available for rent whilst on the Sardine Run. I also read that port St John's is less preferable bc there are many more operators out of there and of three are sardines u need to share with many other boats which also might scare them away. Any truth to this? When based in Port St John’s, we work an area of about 25 miles north of the launch site, and 25 miles south of the launch site. That’s a lot of ocean to cover. Each day, weather permitting, we have two boats out on the water, going in different directions and in direct radio communication with each other. In addition, we have a dedicated micro-light aircraft in the air, directing us to the shoals of Sardines, if they are anywhere 25 miles north or south. Out of Port St John’s / Mbotyi, on a good day, there may be a maximum of 14 boats out at sea. 10 out of Port St. Johns and 4 out of Mbotyi. 14 boats in an area of 50 miles, is insignificant. Also, amongst the “operators”, there is an unwritten law. If you happen upon a bait ball, there are no more than 4 boats in on the bait ball, depending on its size. Once one boat moves away from the bait ball, another boat can take its place. So you are unlikely to have between 10 to 14 boats on a bait ball at any one time. Please understand, its organised, and not a free for all. Please also remember, with hundreds of sharks, thousands of gannets and all the other ocean predators feeding off a shoal of Sardines, 10 boats on the surface of the ocean will have absolutely no effect on the shoal, scaring them away. Would the Sardine Run trip be running in 2016? And would the trip July 10 to 17 out of East London be a good time for this, or is it really too late in the season? Just a bit of background on the Sardine Run so as to try and answer your question “Would the Sardine Run trip be running in 2016? And would the trip July 10 to 17 out of East London be a good time for this, or is it really too late in the season?” Not many people are fully aware of the Sardine Run, where it takes place, when it takes place and why it’s so unpredictable. Following is a bit of background, which is worth reading. The Sardines could start running anytime from the end of May, through June to the end of July. Nobody on earth knows exactly when. The Sardines could come close to shore anywhere between south of East London to just south of Durban. A 1 600 km’s stretch of rugged coast. Exactly where they could come close to shore is anyone’s guess. All we know is that the water temperature must drop below 19ºC for them to come close inland. If the water temperature doesn’t drop below 19º C, they simply stay very far out to sea and stay deep in the search of the colder water. This is when the Sardines don’t run at all, and there have been the odd years that they haven’t “run”. The trick is to try and “guess” where to be based along this 1 600 km stretch of coast, and when. That, I’m afraid, no one can predict. It changes from year to year. As I’ve already said, it’s quite possible that: a) The Sardines don’t show up during any given period. b) Show up an another location than where you are based (East London), either up or down the coast, and due to the isolated location where you are based it’s not possible to quickly move the operation to another location. You are also limited in terms of how much fuel you have on board the boat. c) The weather just does not permit the skipper to launch the boat. That’s the down side. The upside is that all the sea predators are in exactly the “same boat” as you are in. They know as much as you, so all along this 1 600 km stretch of coast are literally thousands of dolphin, whales, sharks, gannets, seagulls, seals, penguins – you name it – all waiting for the arrival of the Sardines. The tell-tail signs that there are Sardines have arrived are the sea birds, especially the Cape Gannet. They usually sit quietly on the water waiting patiently. As soon as the Gannets spot a shoal, they all fly into the air and start dive-bombing the shoal. There are literally thousands and thousands of Gannets. It’s a sure giveaway that there are Sardines. The skipper then moves the boat directly above the Sardines and the fun begins. The choice is then yours. Do you go in quick with mask, fins and snorkel or do you kit up into full scuba gear and drop down to about 10 / 15 meters and watch the action from below. Remember, the shoal is constantly on the move, so sometimes it’s best just to don fins, mask and snorkel and get onto the action ASAP. If the skipper and DM are of the opinion that the shoal will be around for a while, then get into your scuba gear. But the skipper in conjunction with the DM will advise you what’s best. The daily programme is that you launch the boat every morning at about 06h30 in the hope of being in the middle of a shoal of Sardines, with even higher hopes of being on a bait ball, along with all the other sea creatures, so there is never a dull moment. If you do happen upon a shoal, you stay with it as long as possible, if not; you are up and down the coast all day looking for the action. You will return to shore at about 15h00 or when everyone on the boat “has had enough”, and try again tomorrow. But our main and sole objective is to find the shoals of Sardines. So Rick, it’s really a bit of a lottery. July 10 to 17 is as good a guess as any, it’s really “hit and miss”. Please don’t shoot me, I’m just “Mother Natures” and “King Neptune’s” messenger. No matter when you decide to do your Sardine Run, where you decide to be based, and who you decide to book through, the above facts remain. I notice that non-divers are welcome for the sardine run，because the better way to join is by snorkelling. So how about the sailing experience around the wild coast of South Africa？ Is it very bumpy？We totally three Chinese guys, one AOW, one OW, and one non-diver (with snorkelling experience). 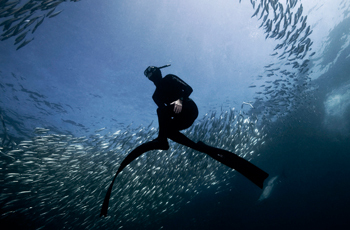 Snorkellers enjoy the Sardine Run as much as certified scuba divers. Before launching the “Duck” or Zodiac all members are dressed in full wetsuits, either 5mm or 7mm, and you stay in the suit the whole day. 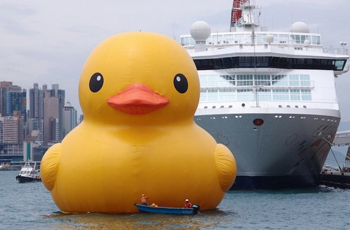 No change rooms on the Duck. If & when you first happen upon a shoal of Sardines you normally get in the water just with wetsuit, mask, fins, and snorkel. If the DM & skipper are of the opinion that the shoal will stay around for a while, they will advise you to don your scuba gear. Scuba divers then drop down to between 5 meters and 15 meters to view the action from below whilst the non-certified divers use snorkel and view the action from the surface. When it’s over, or the shoal has moved on, you all get back in the boat and catch up with the shoal and do it all over again. Can be quite strenuous! It can get quite choppy, and if in the skipper’s opinion it is too rough, he will return to shore or call it off before you launch. Unfortunately, you have to pay the full Expedition rate. The reason for this is because, none of the dive operators who offer Sardine Run Expeditions are permanently based along the stretch of coast between East London and south of Durban, where the Sardine Run usually takes place. They are all based either in Durban, Umkomaas (Aliwal Shoal), Shelly Beach (Protea Banks), or Cape Town. Every year these operators move their entire dive operation, from their base, to their preferred location along this 1 600 km stretch of coast. Be it East London, Mpame, Port St John’s, or Mbotyi. They move their dive operation, lock, stock, and barrel, to one of these locations for the months of, end of May, June to the end of July. Staff, boats, spares for the boats, fuel, compressors, dive gear – absolutely everything. Then they base themselves and their dive crew at the lodge, hotel, B&B of their choice, for two and a half to three months. They then divide the 6 / 8 week period when the Sardines “should be running” into 5 day, 6 day, 7 day, 9 day Sardine Run Expeditions, and they then sell these “Expeditions” as a package. Accommodation, all meals, and full days at sea, weather conditions permitting. With fixed staring dates as per the schedule on our website and with fixed finishing dates as per the schedule on our website. These dates are “set in stone”. You are quite welcome to join an expedition a day or two after its advertised start date, or to finish an Expedition a day or two before the advertised finish date, but you will still have to pay the full Expedition rate as per the schedule on our Website. The rates include cylinder and weights, so any other scuba diving equipments included？like wet suit, fins, BCD , regulator... if not, can we rent there? Correct, rate includes tanks weights and air, all other gear can be rented, but we need to know sizes so that we can have it on site when you arrive. Water temperature must drop below 19°C, otherwise the Sardine don’t show, they stay far out to sea and stay deep. Unlike us, they prefer cold water! So bank on water temperatures ranging from 18°to 21°C. A 5 mm ot 7 mm Farmer Jon wet suit. Hope you well, I’m just enquiring about the Sardine run 2017 if this will be in Durban as well? I ve looked at the schedule online but wasn’t sure if this will ONLY be taking place in the mentioned areas only. The Sardine Run has never, in the past 20 years that we have been doing it, reached as far north as Durban. The further north that I recall it reaching is Shepstone, and that was way back. It starts way south, off the Cape and slowly works its way north up the coast, in cold waters, off shore, and deep. The only known factor is that in order for the Sardines to “run,” the water temperature must be below 19°C. If the temperature is above 19°C, they simply stay way off shore and in the deep, cold waters. That’s why we only operate Sardine Run Expeditions out of East London in the south, Mpame on the Transkei Coast, and Port St Johns in the north. Please go to Sardin Run Page for further information on the Sardine Run. Hello, I would like to ask the difference of Sardine Run packages from East London and Mpame. What is the latest arrival time on the first day? How is payment? Best. Many thanks for spending time on the Dive The Big 5 Website, and specifically on the Sardine Run page. The difference in the cost between the three locations that we use, East London, Mpame, and Port St John’s is firstly the level of accommodation. In East London we stay at Santa Paloma www.santapaloma.co.za which is a far more an “up-market” resort than the place we stay at in Mpame, the Bull’s Inn www.bullsinn.co.za and at Port St John’s where we stay at a place called The creek http://www.thecreek.co.za/ which is about the same level of accommodation as the Bulls Inn. Both more basic than Santa Paloma. The second difference in cost is the length of the Expedition itself. Out of East London, its 5 sea days, with one reserve day, 7 nights, in case we have to cancel one of the sea days, for whatever reason. Out of Mpame its 5 sea days / 6 nights. Out of Port St John’s its 9 sea days / 10 nights. You can arrive any time suitable to yourself on the first day, ideally before dinner, so that you can meet the crew and you fellow participants. The first day of the Sardine run then starts the following day. Then depending on which Expedition you chose, you then have either 5 sea days with one reserve day (East London,) or 5 sea days out of Mpame, or 9 sea days out of Port St John’s. Payment is a 10% non-refundable deposit on booking, and the balance, 30 days before the start of the Expedition you chose to join, subject to availability. They are filling up very fast as it’s not long now before the first Expedition date out of East London, on Sunday, May 21. Does Port St John’s has the biggest possibility to see the Sardine Run and bait ball? Please understand that the Sardine Run is a natural phenomenon, meaning nothing is guaranteed, and no one location, East London, Mpame, or Port St Johns, is better than another. In order to help you decide where to be based, let us explain as best we can. The only known fact is, that unless the water temperature drops below 19°C, the Sardines simply don’t “run.” The shoals of Sardines prefer cold water, and if the temperature does not drop below 19°, they simple stay far out to sea, and deep, where the colder waters are, and don’t venture close to shore. This is when they don’t “run, and it has happened often in the past. So, as you can appreciate, no-one can guarantee the Sardine Run. The other known factor is that the sardines start their “run” (migration) south of Cape Town, and work their way north, up the east coast of South Africa. They first reach offshore East London about now, end-May. As they work their way up north, the next best place to be based is Mpame, which is north of East London, but south of Port St Johns. About mid-way between East London in the south, and Port St Johns in the north. That’s the safe bet where to be based. Then as the shoals migrate north, they leave the East London area in the south, to Mpame. Then towards the end of June to mid / end July they are in the Port St John’s area. Then they send to head out to sea, and follow the Agulhas current all the way back to the Cape where they start the whole process again next year. But please remember, if the water temperature along the coast is not below 19°, is does not matter where you are based – they will not come close to land. So, in a nut shell, and assuming the water temperature is right, they first reach East London towards the end of May to mid-June. Are in the Mpame area, mid-June to mid-July. Then, in the port St John’s area, mid-June to the end of July. That’s simplistically put, but nothing is nature is simple, so please don’t hold us to the above. Can I combine the Sardine Run tour with the giant kelp shark diving tour? If you are referring to the Broadnose Sevengill Shark, Notorynchus cepedianus, these are found in great numbers in False Bay, near Simon’s Town, and you can expect to encounter them all year round. So the answer is yes, you can combine diving with the Broadnose Sevengill Shark with a Sardine Run. Sharon, if you are thinking about joining this year’s Sardine Run, we urge you not to leave it too late, as they are due off East London any day now. 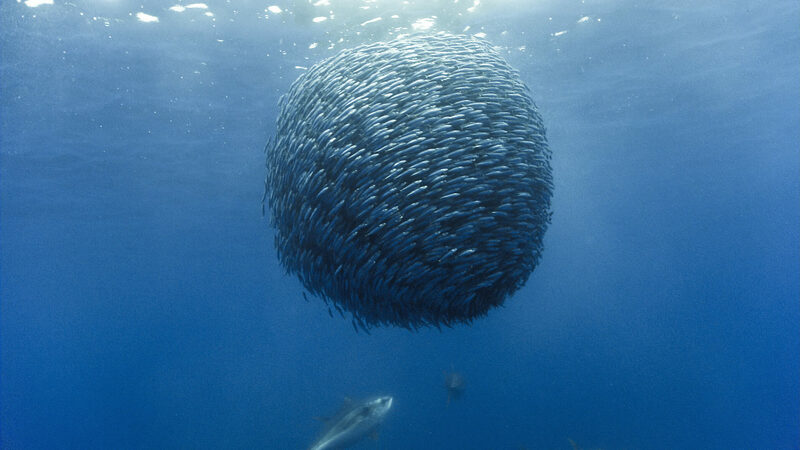 A bait ball, or baitball, occurs when small fish swarm in a tightly packed spherical formation about a common centre. It is a last-ditch defensive measure adopted by small schooling fish when they are threatened by predators. Small schooling fish are eaten by many types of predators, and for this reason, they are called bait fish or forage fish. 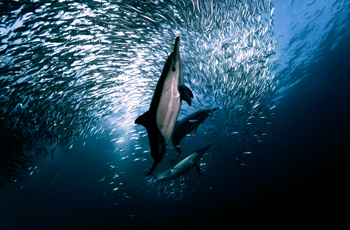 For example, sardines group together when they are threatened. This instinctual behaviour is a defence mechanism, as lone individuals are more likely to be eaten than an individual in a large group. Sardine bait balls can be 10–20 metres in diameter and extend to a depth of 10 metres. The bait balls are short-lived and seldom last longer than 10 minutes. However, bait balls are also conspicuous, and when schooling fish form a bait ball, they can draw the attention of many other predators. As a response to the defensive capabilities of schooling fish, some predators have developed sophisticated countermeasures. These countermeasures can be spectacularly successful, and can seriously undermine the defensive value of forming bait balls. Please Note: When on the Sardine Run, diving on bait balls is extremely rare. The sardine sun relies on the coming together of many different variables: weather and currents, predators and of course, the sardines! Some days are going to be quiet and some days will be very busy. We will do our utmost to get you into the best position to appreciate this event, either from the boat or in the water. I guess I’m safe in assuming that you’ve been onto our Website, and by so doing, you know a bit about the Sardine Run? The most important point that you are concerned about, I think, is can you partake without being a scuba diver? Most definitely! Lots of action is viewed from the boat, like thousands of dolphin, thousands of sea birds like the Cape Gannet “bombing” the shoals of Sardines, Whales breaching and the like. Then a non-scuba diver can get into the water on snorkel, as long as you can swim or stay afloat, and follow the action as it unfolds below. Most of the action takes place within 5-meters of the surface. 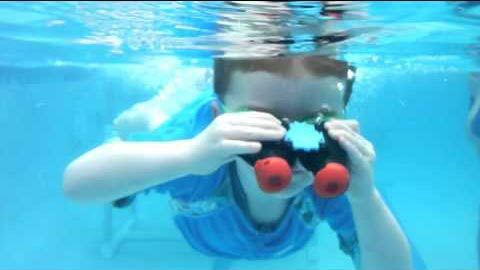 Is your camera a waterproof camera or do you have a housing for it? Having said all the above, please go to the Sardine Run page of our Website:- https://www.divethebig5.co.za/2018-sardine-run.html to see which Sardine Run Expedition you would like to join, and if you click on the “location” of each Expedition you will get a day-by-day itinerary of the Expedition of your choice. Please also remember that there is an “Early Bird” discount of 5% on the advertised price if you book and pay the 10% deposit before February 01. This “special” is only available for Expeditions out of Mpame and Port St John’s subject to availability. Whist we are at it, if you are an avid amateur photographer, and you are in South Africa on the Sardine Run, why not take a few days on safari in Kruger National Park. This will afford you the opportunity to film all of the “Big 5” (lion, leopard, buffalo, elephant, & rhino) in their natural environment? This we can arrange as well. Statistically, during all your years of operation, what percentage of 1 week trips ended without observing the sardine run at all in any significant way? In other words - what are my chances not to see anything? The Sardine Run covers a vast area of coastline, from south of East London to north of Port St John’s. There have been years that the Sardines have failed to pitch, but this has been due mainly to the waters close to shore being too warm. In order for the Sardines to make “landfall,” the coastal waters must be below 19°C. If this does not happen, then the Sardines stay way out at sea, and stay deep, where the waters are cold. 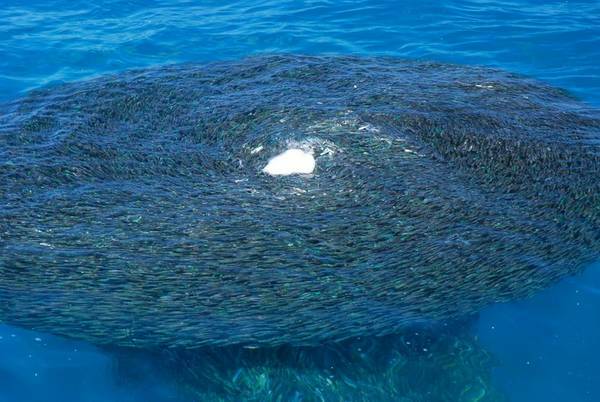 If this does happen, you might not see Sardines, but all the oceans predators that feed on the shoals of Sardines are in the same “boat” (predicament) as you. They are all there, waiting for the arrival of the shoals of Sardines. So the ocean is alive with whales, dolphins, seals, game-fish, penguins, Gannets etc, etc. The ocean is alive with wildlife, there is never a dull moment. If nothing happens during the time at sea - do you have a backup plan? Weather permitting, we launch the boat every morning at about 08h00, and spend the whole day at sea, until about 15h30, or when the general consensus of the divers on the boat is that they have had enough, then we return back to base. The actual give away that there are shoals of Sardines about, are the thousands of sea birds, especially the Cape Gannet. They sit peacefully on the water, waiting. As soon as there are Sardines, they fly high into the air, in their thousands, and start dive-bombing the shoals. This is a sure give away that there are shoals in the area, and all the boats in the area head for were the Gannets are dive-bombing. Also, we are in radio contact with all the other boats in the area, and as soon as one boat has “Sardine action” they radio all the other boats in the vicinity. Please be aware, if there are Sardines within miles of us, we know, and we head for the action. Should the weather prevent us from launching, there is always a back-up plan, usually a land based activity, depending on where you are based, East London, Mpame, or Port St John’s. Is there any pattern to the sardine run? Wish there was!! 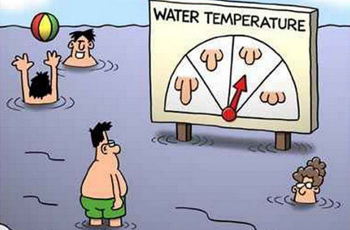 All we know is that the water temperature must be below 19°C. 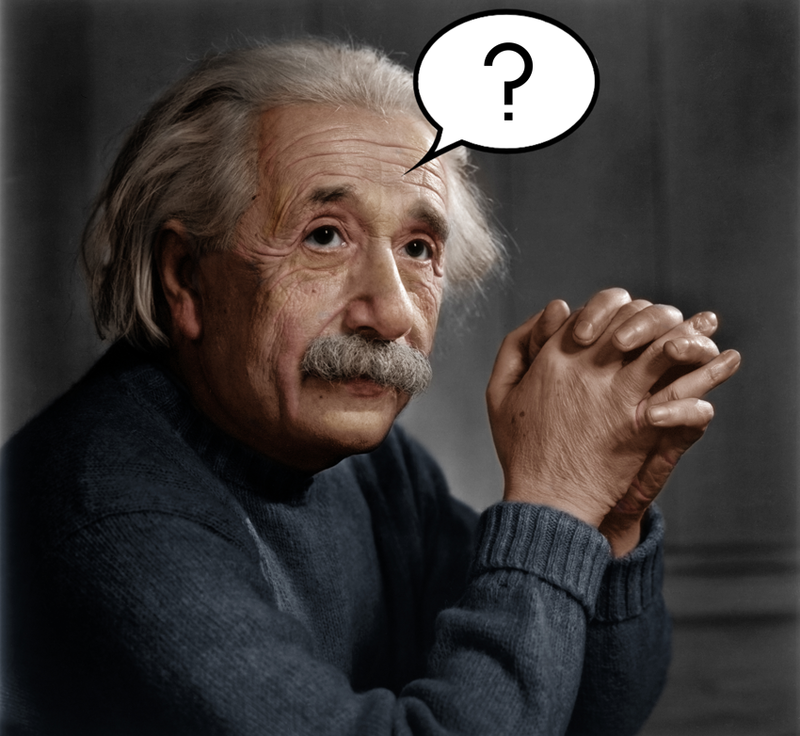 For example, if we see activity on a certain day, does it indicate anything about the activity during the following day(s)? Nope, afraid not. This is a huge migration of fish, which can be seen from space by the astronauts orbiting the earth. Constantly on the move. Each day is a new day, with new excitement and sightings. What percentage of the "time in the water" is spent snorkeling, and what percentage is diving? That depends on the divers and the advice given by the Skipper, DM, and Marine Biologist (if present.) If the shoal is moving, the Skipper tries to position the boat in front of the oncoming shoal, and the divers get in the water in front of the approaching shoal, either on full scuba or on snorkel, depending on how fast the shoal is moving. The Skippers and DM’s who have been doing the “Run” for years, are the best people to advise on whether to use Scuba or snorkel. If you happen on a bait-ball, which is everyone dream, this is usually static, and then the Skipper & DM will advise the certified divers to don Scuba and drop down to about 10 meters and view the action from there. But it varies from sighting to sighting. 5mm or 7mm? Considering the water temperature, I would opt for 7mm, but I realize it will limit my movement... Can you comment on this tradeoff? That depends purely on what temperature of water you are used to diving in. 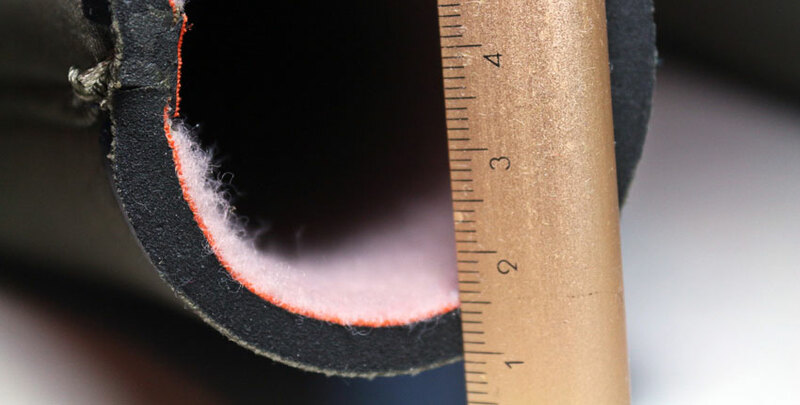 If you are from any of the Scandinavian countries, 5mm is fine, but usually 7mm is recommended. Definitely no semi-dry, or dry suit. Remember, you are in it the whole day, and there are no marine-heads on a Zodiac! Can I rent dive equipment (BCD, regulator)? Yip. Gear hire rates are at the bottom of the day-by-day itinerary for each of the expeditions out of either East London, Mpame or Port St John’s. Can I combine a sardine run trip with 1 or 2 days of diving with sharks? What are the "must do" dives during this season? What about a wildlife safari in either Hluhluwe or Kruger to de-gas after the diving. After all, you are in Africa, and we have the best safari destination in the world! I'm possibly interested in the sardine run this year. Would be able to tell me the pros/cons of selecting the different locations that the dive trips are offered from? Also, is there anything special about Mpame that allows you to dive day-by-day as opposed to booking a multi-day trip? Thanks for visiting our Website and for taking the effort to submit the “Contact Us” link. When considering your Expedition location of choice, please bear in mind that the Sardines move up South Africa’s east coast from the waters off Cape Point in the south, to just after Port St John’s in the north. They first encounter land in the south, at about East London, at the end of May. Move from East London, in a south / north direction, to Mpame in the middle, from about mid to end June, beginning July. The shoals then end up in the north, at Port St John’s, from about the beginning of July to the end of July. They then head back out to sea, and catch the Agulhas current, which takes them from Port St John’s in the north, way back to the cold waters off Cape Point in the south, where they spawn, before starting their migration back north, in May 2019. That’s very simply put!! Where you want to be based depends on when you want to travel. If it’s at the beginning of the Sardine Run, from end May to mid / end June, then based yourself in the south, in the East London Area. If it’s in the “middle” of the Sardine Run, from about mid-June to Mid-July, then the safe bet is to be based at Mpame. If it’s towards the end of the Sardine Run, beginning to end of July, then base yourself at in Port St John’s. But please remember, this is just a rough guide, and please also remember, the Sardines have not read this e-mail, so they don’t know where they must be, and when!!! All Expedition dates, out of any of the above three locations, have a set start, and a set end date, and these dates are “set in stone,” and if you are interested in joining any of the above, you must start the Expedition on Day 01 and end the Expedition on the last day. Please let me know if there are any further questions? we are interested in the sardine run. which timeframe would you recommend for the sardine run? when do we have the best chance to have lots of action? is it like the two last weeks are usually lower of activity than beginning till mid july? how was it in the last years? how is usually day on the water? is it liek you drive hours and there is nothing or do you sea a lot humpbacks, dolphins? get in the water and out or is it often like waiting a long time on the boat and maybe we can go in for a few seconds??? how are the days usually in June from the 20th of June till 25th or end of June compare to beginning till mid July?around coffee bay, port st. johns.. i know its nature but just from your experience in the last years? Many thanks for your mail regarding the Sardine Run Expedition. May we suggest you do, as most of the information pertaining to our Sardine Run Expeditions is contained on our Website. And scroll down to “The Sardine Run” as all the questions we have ever been asked, and our answers, are to be found there. Both make interesting reading, and should give you all you want to know about Dive The Big 5’s Sardine Run Expeditions. We were please to read in your mail “i know its nature” then you’ll appreciate a lot of what we are saying below. The only “given,” or scientifically known factor is that the water temperatures must drop below 19°C for the Sardine Run to take place at all. If the water temperature does not drop below 19°C, the Sardines simply stay way out at sea, and deep, where we cannot reach them. This has happened in the past. It is not possible to document this as the Sardine Run covers a vast area, and the Sardines may not come close to land in some areas where the sea temperatures are too warm, and a couple of hundred kilometres north or south the water is much colder, and they reach land! The Sardines move up South Africa’s east coast from the waters off Cape Point in the south, to just after Port St John’s in the north. They first encounter land in the south, at about East London, at the end of May. Move from East London, in a south / north direction, to Mpame in the middle, from about mid to end June, beginning July. The shoals then end up in the north, at Port St John’s, from about the beginning of July to the end of July. They then head back out to sea, and catch the cold Agulhas current, which takes them from Port St John’s in the north, way back to the cold waters off Cape Point in the south, where they spawn, before starting their migration back north, in May 2019. That’s very simply put!! This covers about 1 500 km’s of South Africa’s eastern seaboard. The total length of our seaboard is in excess of 3 000 kilometres, so it’s quite a large area that they / we cover. The beginning of the Sardine Run is from “about” end May to “about” the end of July. If you plan to be in South Africa at “about” the end of May towards “about” mid / end June, then based yourself in the south, in the East London Area. If you plan to be in South Africa “about” mid-June to Mid-July, then the safe bet is to be based at Mpame. If you plan to be in South Africa “about” the beginning to end of July, then base yourself at in Port St John’s. Please remember, the above is just a rough guide, and please also remember, Mother Nature as well as the Sardines have not read this e-mail, so they don’t know where they must be, and when! All Expedition dates out of any of the above three locations have a set start, and a set end date. These dates unlike Mother Nature’s dates, are “set in stone.” We are mere mortals. If you are interested in joining any of the above Expeditions you must start the Expedition on Day 01 and end the Expedition on the last day. The only exception is the Expedition out of Mpame, but that is subject to availability, and subject to the fact that the day you choose is one of their scheduled “sea days.” How? Weather permitting, we launch the boat every morning at about 08h00, and spend the whole day at sea, until about 15h30, or when the general consensus of the divers on the boat is that they have had enough, then we return back to base. Please remember, the boats we use for the Sardine Run are “Rubber Ducks” or Zodiacs, or RIB’s, with no marine head. Semi-dry or dry-suits are definitely not recommended. The cost of an Expedition includes full rental hire. We strongly suggest that you leave your dive gear at home. The actual give away that there are shoals of Sardines about, are the thousands of sea birds, especially the Cape Gannet. They sit peacefully on the water, waiting, like everything else, us, the sharks, the game-fish, the whales, the dolphins, the penguins, etc. As soon as there are Sardines in the area, the Cape Gannets fly high into the air, in their thousands, and start dive-bombing the shoals. This is a sure give away that there are shoals in the area, and all the boats in the area head for where the Gannets are dive-bombing. We are in radio contact with all the other boats in the area, and as soon as one boat has “Sardine action” they radio all the other boats in the vicinity. Please be aware, if there are Sardines within miles of us, we know, and we head for the action. If there are no Sardines about, which is quite possible, we stay out at sea, hoping. The consolation being that all the other predators in the ocean are also out there with us waiting and hoping, so there is always lots of action. If there are not Sardines we could do a “bounce dive” to see what sharks are about. We could follow thousands upon thousands of dolphin, and if they are willing, we dive with them. We could hang around the whales and watch them breach. In South Africa it’s not permitted to approach within a certain distance of a whale (I’ve forgotten what this distance is,) but there is no law preventing the Skipper dropping the divers in front of oncoming whales, at letting the Whales come to you! If there are no Sardines about, there is still loads of action to be seen from the boat. Should the weather prevent us from launching, there is always a back-up plan, usually a land based activity, depending on where you are based, East London, Mpame, or Port St John’s. Kira, I hope the above answers most of your questions, if not please mail us and we’ll attempt to answer any more that you may have, Please note that the Expeditions are beginning to fill up rapidly, and the closer you get to the Expedition date of your choice, the more likely it will be to be “SOLD OUT!” Already a large number of our Expeditions are “SOLD OUT!” Please have a look at the availability on our Website as we update this weekly. And scroll down to “2018 Sardine Run Dates & Rates” to check availability. Typically on the safari do you go out early in the morning then late in the afternoon because of the heat at noon the animals lay low or sleep? Correct. Animals are most active in the early morning, from sunrise until about 09h30 when it starts to heat up. Then the prey species (impala, zebra, wildebeest, kudu, and other antelope species) seek respite from the heat and lie low in the shadows, under trees and in “donga’s” (ditches and river courses). At about 15h30 it stars to cool off again and that’s when you go out on safari again, as that’s when the animals become active again. After sunset, when it’s dark the predators are active using their superior night vision and stealth to hunt their pray, impala, zebra, wildebeest, kudu, and other antelope species. That’s also when you see the nocturnal species like nag apies, porcupine, honey badger, civet, serval, and hyena etc. You usually return to camp at about 19h30 for dinner, as it’s very difficult to spot the nocturnal species with a spot lamp when they are on the move hunting. The larger species (like elephant, rhino, giraffe, hippo, etc) and primates (like baboons and vervet monkeys) are seen throughout the day and often from the lodge at a water hole or river near the lodge. In between morning and evening safari you have the option of going on a bush walk with an armed ranger and tracker to see and experience the smaller things in the bush which you tend to miss from a Land Rover, like spoor, droppings, birds, bugs etc. It’s an action packed day from before dawn to well after the sun has set! How much should I budget for a wild Safari option 4 for 3 people (2 Adult and a teenager)? Also what time year would you recommend? I did Gansbaai with you back in 2000. Many thanks for the mail. It also shows that our e-mail bulletins get to our old “dive buddies.” 2 000 was a long time ago. Lots of water has flowed under the bridge since then! Hope you are all well? Thanks. Chris, a few questions first. How long do you intend visiting South Africa for? 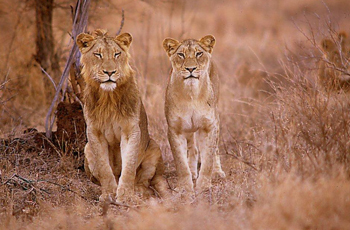 Is the main focus of your visit a safari, or do you have other destinations on your agenda? How old is the teenager? Do you want a double and a single room, or are you happy with three persons sharing in one room? As for the safari itself, for starters, please can you go to the following link on our website:- https://www.divethebig5.co.za/wildlife-safari-options.html and look at the four basic options available to you, and let me know which one of the four you fancy the most. 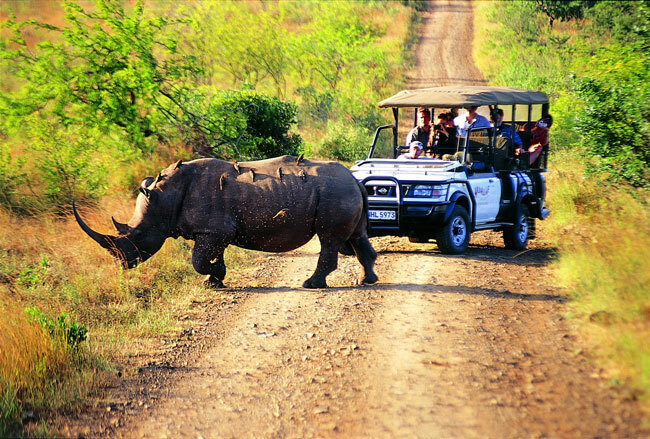 The two main and most popular safari destinations in South Africa are:- Kruger: https://www.divethebig5.co.za/kruger-park.html Hluhluwe / iMfolozi: https://www.divethebig5.co.za/umfolozi.html Outside South Africa’s borders, we also offer safaris to:- Victoria Falls in Zimbabwe & Zambia: https://www.divethebig5.co.za/victoria-falls-2.html Botswana, specifically the Okavango Swamps, Moremi, Savuti and Chobe: https://www.divethebig5.co.za/botswana-2.html Namibia, specifically Etosha: https://www.divethebig5.co.za/namibia.html Without doubt, the best time of year to go on a safari is in our winter, May through September. It’s our dry season, so the bush is not so thick, making animal spotting so much easier. Being the “dry season,” and most animals must drink daily, the animals do not wander far from water points, also making it easier to spot the animals. It’s more comfortable, temperature wise, for visitors from Europe and North America. Chris, I know I’ve given you loads of information for you and your family to digest, but in order to give you the best possible experience, I need to know details. Looking forward to working with you on this. I'm going to be in KZN in October next year and am really interested in snorkelling with Whale Sharks. Can you provide more details on this? To be perfectly honest, you stand very little chance of encountering Whale Sharks off the coast of KwaZulu/Natal in October. Although there are "common sighting" of Whale Sharks along the KwaZulu/Natal coast during the summer months, November through March, these are sporadic and cannot be relied upon. Unlike the sightings of Whale Sharks further north along the Mozambique coast in the area off Inhambane, Barra, Tofo and in the Bazaruto Archipelago. Here Whale Sharks are regularly encountered by divers on their way out to a dive site and on their way back from a dive. The distance from the shore to the reefs is anything from a few hundred meters to 25 km’s out to sea, so the chances of “bumping” into a Whale Sharks is very good when on your way to and from a dive. As soon as the caudal fin of the Whale Shark is spotted, the skipper of the “duck” (Zodiac or RIB) positions the boat in the path of the oncoming Whale Shark and the divers bail overboard, as quickly and quietly as possible, and wait for the Whale Shark to swim up to them. The amount of time that the divers are able to interact with the Whale Shark can be anything from a few seconds to 15 minutes and longer, depending on the individual animal. Experience has shown that it’s best to interact with the Whale Sharks when on snorkel and not on scuba as the exhaust bubbles from the regulator often frightens the Whale Sharks away. For the non-scuba diver wanting the experience of being able to interact with Whale Sharks, you are able to charter a “Rubber Duck” purely for this purpose, and you spend as many hours as you like cruising the back-line, just beyond the breakers, looking for, and when found, interacting with the animals. The “Duck’s” are chartered out on an hourly bases, just as they would be for divers going on a dive or for deep-sea fishermen going out for a day’s fishing. Please let me know if you would like any further information and if you would like some guidelines on where and what to dive on your trip to South Africa next October. We also book safaris, so are able to help you with that as well. About 30 meters max, but the crew spot the shark approaching the decoy a long time before it’s on the decoy, they do this daily and know where and what to look for, and as soon as they spot the shark approaching the decoy they start reeling the decoy in, and try to get the shark to breach as close to the boat as possible. A good lens 70/300 should be enough. The east coast of Southern Africa is blessed with a very healthy population of “Rhincodon typus” or Whale Shark, for now! Unfortunately these gentle giants are being mercilessly fished by the local fishermen along the entire east coast of Africa. Whale Sharks are highly efficient filter feeders favouring the warmer waters of the oceans following seasonal concentrations of food. Off the coast of southern Africa, their range extends from the sub-tropical waters of KwaZulu/Natal north to the equator and beyond. Being warm water animals, in South Africa they are seasonal and are found mainly off the KwaZulu/Natal north coast in the summer months (November through March) when the water temperatures reach a maximum of about 28º C. However, off the cost of Mozambique, which lies mainly in the tropics, they are found year round. Bearing the above in mind, you will find “the occasional” Whale Shark in the waters off the KwaZulu/Natal north cost during the months of November through March. Off the cost of Mozambique, the concentrations of Whale Sharks are the greatest north of Xai Xai. Here you are likely to find Whale Sharks all year round, with greatest concentrations in the summer months when the waters are at their warmest. The best way to interact with these giants of the ocean is to “cruise” the back-line just beyond the breakers in a boat. The tell-tail sign that there is a whale Shark in the water is the tip of their caudal fin breaking the surface of the water. Because the boats that we use off the coast of Southern Africa are mainly “Rubber Ducks” or Zodiac’s we are positioned very low in the water so it is not possible to spot the animal’s great hulk from above. The other way in which to spot them is from a micro-light aircraft, but this is very expensive as there are no micro-lights based anywhere along the coast of Mozambique, so the plane and pilot would have to be “imported”. Divers wanting a Whale Shark experience are normally based at a dive resort along the cost of Mozambique, either at a resort close to the town of Inhambane, on one of the islands of the Bazaruto Archipelago or at Pemba in the north of the country. The Whale Sharks are usually encountered on the boat ride out to the dive site, and on the return trip back to shore after the dive. The distance from the shore to the reefs is anything from a few hundred meters to 25 km’s out to sea, so the chances of “bumping” into a Whale Sharks is very good when on your way to and from a dive. As soon as the caudal fin of the Whale Shark is spotted the skipper of the “duck” (Zodiac or RIB) positions the boat in the path of the oncoming Whale Shark and the divers bail overboard, as quickly and quietly as possible, and wait for the Whale Shark to swim up to them. The amount of time that the divers are able to interact with the Whale Shark can be anything from a few seconds to 15 minutes and longer, depending on the individual animal. Experience has shown that it’s best to interact with the Whale Sharks when on snorkel and not on scuba as the exhaust bubbles from the regulator often frightens the Whale Sharks away. For the non-scuba diver wanting the experience of being able to interact with Whale Sharks, you are able to charter a “Rubber Duck” purely for this purpose, and you spend as many hours as you like cruising the back-line, just beyond the breakers, looking for, and when found, interacting with the animals. The “Duck’s” are chartered out on an hourly bases, just as they would be for divers going on a dive or for deep-sea fishermen going out for a day’s fishing. To be able to get to any of the main locations in Mozambique, either, Inhambane, the Bazaruto Archipelago or Pemba is to fly. Flights depart out of Johannesburg International but to Inhambane and to Pemba, these flights only operate on certain days of the week, unlike flights to Bazaruto which operate daily. Divers must also please remember that Whale Sharks are animals in the wild, who have the whole world’s oceans as their “back yard”. They are extremely sensitive to water temperature, ocean currents, wind and most importantly, the availability of zooplankton, which is their main source of food. Having said that, you must appreciate that although the east coast of Southern Africa has a large and currently healthy population of Whale Sharks it is impossible to guarantee sightings of these gentle giants of the ocean. Obviously the more time you are able to spend on the water looking for the Whale Shark, the better your chances are of interacting with them. Whale Sharks are also protected species in the waters of Mozambique with the result any diver, snorkeler or swimmer want to go out and interact with Whale Sharks will be required to sign a “Code of Conduct” (attached) which specifies the “Do’s and Don’ts” when diving and interacting with Whale Sharks. As you will see from this code of conduct, it is forbidden to touch and hang on to these animals. Please be advised of this, as this code of conduct is strictly enforced and is there for the protection of these wonderful animals. Also, when diving anywhere in South Africa or Mozambique, please don’t expect to do more than 2 dives a day. By noon, along the entire east coast of southern Africa the wind tends to pick up quite a bit, causing white caps on the ocean and making diving conditions difficult and even dangerous. As all dives are drift dives, it’s very difficult for the skipper of the Rubber Duck to spot the buoy in rough conditions and even more difficult to spot individual divers as they surface after their dive. The first dive of the day is usually scheduled for sunrise with the second dive of the day being scheduled after surface interval time and breakfast, at about 10h30. By noon, when the wind has picked up, all dives for the day have been completed. If by chance there is no wind, then a 3rd or even 4th dive might be possible, but this is very unlikely. The wind tends to drop by about 17h00, and if it does, then there is the possibility of a night dive. But this can only be confirmed on the day, at about mid-afternoon. Remember when diving anywhere off the coast of Mozambique you are thousands of kilometres from the nearest medical facility and recompression chamber with the result that all dive operators in Mozambique do not allow "pushing the limits" and prefer to err on the side of caution, so as to minimise the possibility of any dive accidents. There is no technical diving or deep de-co diving in Mozambique. That’s the whale shark story. We would like to know if it s possible to go with you to do snorkeling to eventually see whale sharks just for one day or half day? We will be in the region around the 4th of november. I'm afraid that to spend one day looking for Whale Sharks off the coast of South Africa, specifically off Sodwana Bay, because that is the place that they are "occasionally" encountered, is expecting nigh on the impossible. Sodwana Bay offers the best chance of encountering Whale Sharks during our summer months, November through March, but they are few, and far between, and cannot be encountered with any regularity or certainty. Off the coast of Mozambique, you stand a far better chance, but I doubt if you will be that far north. Is it possible to go whale shark diving in April in South Africa? I am interested in shark diving for my husband and I. Kindly advise on cost, requirements, and location. Not an easy question to answer, as South Africa has a 3 000 km coastline, and we are blessed with a very large variety of sharks, from Great Whites, Mako, Blue, Sevengill, Guitar, Sand Tigers (Raggies or Grey Nurse Sharks), Tiger Sharks, Bull (Zambezi) Sharks, Hammerhead Sharks, Copper Sharks, Black Tip Sharks and many, many, more species. All of which divers would love to dive amongst! Sharks are also to a large degree, territorial. So a shark that prefers warm waters won’t be found in the cold waters off the Cape. Likewise, Great White’s which prefer the colder waters won’t be found in the tropics. 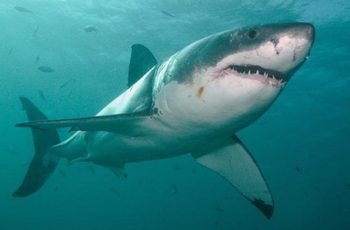 To compound matters even more, sharks are seasonal. Some species are resident and stay the whole year round, other, come and go according to the seasons. So……. After that brief introduction to shark diving:- Are you and your husband certified divers? That will limit you to the type of shark diving you will be able to do. Where do you want to do your shark diving? Cape Town, Simon’s Town, Gansbaai, Mossel Bay, Port Elizabeth, Protea Banks, Aliwal Shoal, or Sodwana Bay. What type of sharks would you preferably like to dive with? Great White’s, Blue Sharks, Mako Sharks, Sevengill Sharks, “Raggies” (Sand Tiger or Grey Nurse Sharks), Tiger Sharks, Zambezi Sharks (Bull Sharks), Hammerhead Sharks? What time of year do you want to dive with the sharks? As I’ve already said, most sharks are “seasonal”. Please follow this link for the Shark Timetable. Please also remember, the sharks haven’t read this timetable. http://www.divethebig5.com/shark-diving/timetable.html And lastly, how long would you and your husband like to spend diving with the sharks? Looking forward to introducing you to our wonderful shark populations and to getting you “wet”. ALSO, I have a slightly crazy fellow who wants to free dive with sharks…the ones with the big teeth…he’s an ex marine, so has all the scuba qualifications required, what can you offer on this level and an afternoon of shark swimming? As for “free diving” with sharks! That’s a completely different “kettle of fish”, if you will excuse the pun. South Africa is reputed as having some of the healthiest shark populations in the world. We were the first country in the world to protect the Great White Shark and this was done as an act of parliament way back in 1991 and since then lots has been done to protect the sharks off our coast. But having a 3 000-kilometre coastline it’s not a simple task, but never the less we are blessed with an enormous number of shark species. And for this reason South Africa must rank as one of the top spots in the world to view and swim with sharks. 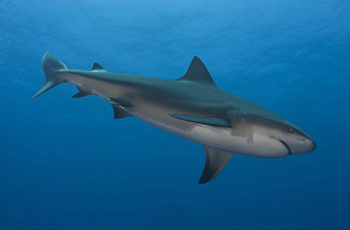 Most divers who want to dive with sharks don’t want to come and dive with the tame ”Micky Mouse” species, like the Shy Shark, Cow Shark, Gully Shark, and Broadnose Sevengill Sharks, Blacktip Reef Sharks, etc. They want to dive with the big “Man Eating Sharks”!! # 1 on the list is the Great White, thank you David Benchley and Steven Spielberg! Then next on the list are the Tiger Sharks, Bull (Zambezi) Sharks, Grey Nurse (Ragged Tooth) Sharks, Hammerhead Sharks, Blue Sharks, Mako Sharks, the list just goes on and on. 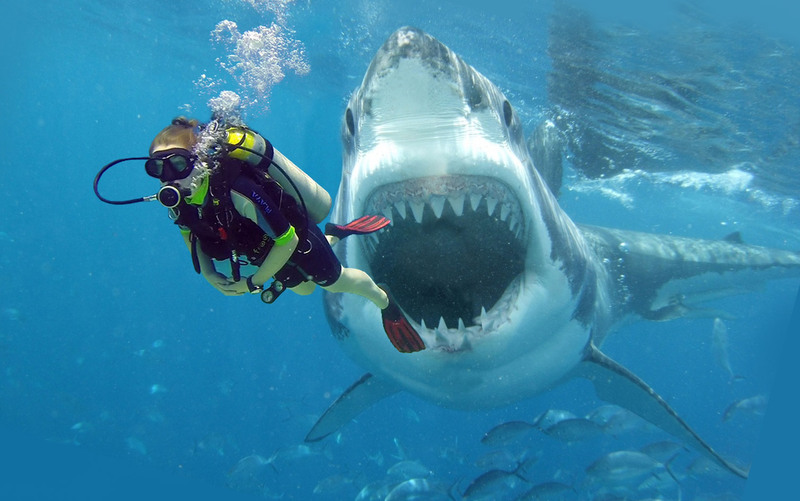 For starters, in South Africa it is illegal to “free dive” with the Great White. 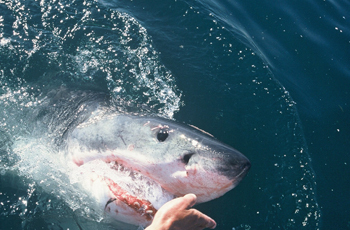 All Great White Shark diving is done in a cage out of Simon’s Town, Gansbaai or Mossel Bay. http://www.divethebig5.com/shark-diving/shark-diving/great-white-shark/gansbaai-simonstown.html there is no cage diving off the KwaZulu/Natal. 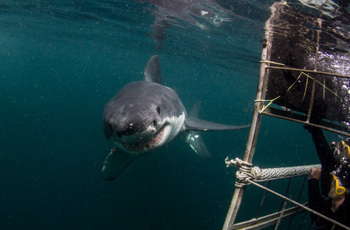 The only cage diving is Great White shark cage diving which takes place off Cape Town at either Simon’s Town or Gansbaai. Free diving, or a “baited shark dive” http://www.divethebig5.com/shark-diving/shark-diving/the-bait-debate.html is done off Cape Point (Blue & Mako Sharks), off Protea Banks – Shelly Beach, and off Aliwal Shoal – Umkomaas, (Tiger, Zambezi, Raggies, and Hammerheads). These are all seasonal and we suggest you go to the following link to establish the best months of the year to dive with what species of shark. http://www.divethebig5.com/shark-diving/timetable.html A Baited Shark Dive: When we dive with Blue Sharks, Mako Sharks, Tiger Sharks, we use the “baited sub surface drift” method. 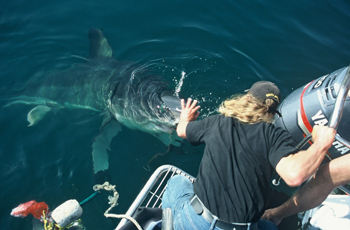 We started the surface work a la’ the Great White Shark cage diving in 2002 /3, but without a cage, and it has been very successful, other than breaching, we are getting all the other behavioral “stuff” that they get with the Great Whites. And the most asked question!!! Why do we use a cage when diving with Great White’s yet when diving with Tigers, Blue’s, Mako we don’t use a cage?? Are Tiger Sharks / Blue Sharks / Mako Sharks not dangerous? All wild animals in their natural environment are dangerous, but unlike Great Whites who prey mainly on live animals, Tiger Sharks especially are scavengers, and prefer to eat something that’s already dead rather than to hunt live pray. Let’s hope the Tiger Shark agrees!!! Once we arrive at the dive site, we start chumming so as to attract the Tigers / Blue & Mako Sharks, and put out a buoy with the bait, which is contained in a stainless steel “box” with holes in it, so that the “smell” and oil from the sardines in the “box” permeate into the water. When the first sharks appear, the DM assesses the situation and if he is of the opinion that the sharks are going to stay around awhile and that they are not aggressive, the divers may enter the water. Either you can view the action from the “safety” of the boat, or for non-certified divers, on snorkel, certified divers drop down to about 5 meters and follow the action from below. This is a drift dive as the boat, chum and bait is drifting with the wind and surface current, as are the divers at 5 meters. Should the sharks swim off or disappear, the snorkelers and divers climb back onto the boat and we move to another location and start all over again. For this type of dive, you don’t have to be a certified diver, so an uncertified diver does the dive in the surface of the ocean using snorkel, mask and fins. In order to drop down to where the bait box is suspended, you have to be an OW1 certified diver. Diving with Raggies, Bull and Hammerhead is very seasonal and we usually encounter these species on a normal reef dive, but are “target species” in that we concentrate the dive around encountering these specific species, which are very seasonal. No, not really! There is not good snorkelling anywhere in South Africa or Moz. In shore, the waves are quite big and there are no real reefs, mainly sand. All our diving takes place quite far out at sea, and at a depth of 6 meters plus, requiring a boat to get to the reefs. We are not really a snorkelling destination. I see you don’t mention the French rugby teams performance against South African “bokke”. I'd be grateful if you could give me some information about diving in Sodwana bay. I'm interested to know in mid July - august whether divers are likely to encounter dangerous sharks whilst diving or snorkelling on the reefs? Sodwana’s reefs are the southernmost coral reefs in the world, even more south than Australia’s Great Barrier Reef, and is South Africa’s most popular dive destination. You are very unlikely to encounter any “dangerous” sharks whilst diving on Sodwana’s reefs. The only shark species that you are likely to encounter, if you are lucky, are Blacktip Reef Sharks, Sand Tigers, “Raggies,” or Grey Nurse Sharks, and Whale Sharks which are not really “sharks” per se. However having said that, the oceans have no borders or boundary’s, and the odd Great White, Bull Shark and Tiger Shark have been spotted in Sodwana’s waters, but these are very rare sightings, few and far between. Sodwana is also not really a snorkelling destination, so please do not plan a trip to Sodwana if you specifically want to snorkel. The only snorkelling is at low tide in the rock pools in the area. Once the tide turns, there is no snorkelling anywhere off Sodwana coast. You have a very small window of snorkelling opportunity, only at low tide. We have a client. She is not a Padi diver but CMAS. So as CMAS says she is not "autonome" she needs to have a "private guide", someone who takes care of her.Is it clear ??? Can you assist? Got it! All our dives in South Africa and Moz are led by a qualified Dive Master. They actually go down with each group of divers, the DM has the Surface Maker Buoy (SMB), and stays with the group till the last diver is low on air, and then they both ascend together. Any diver who is heavy on air, and need to ascend before their buddy, advises the DM that they are low on air, 50 bar, and ascends on their own on the buoy line. It’s all very organised and controlled. In Apartheid days the likes of PADI, NAUI, BSAC all boycotted South Africa, and the only certification agency in the country was CMAS, so you will find, all us “oldies”, are CMAS certified. Now its 90% PADI. One of divers is PE40 - That means he is a 1*CMAS and he has a supplementary "brevet" PE40 : he can dive at 40m with a private guide. Can you please give me the rate for a private guide for him ? For the CMAS 1* diver, with “brevet” PE40, it will be no problem. We will request that he / she buddies up with the Dive Master. All dives in South Africa, and Mozambique, are accompanied by a fully qualified Dive Master (DM). The dive master has the SMB (Surface Marker Buoy). The DM is always the first to descend and waits at the bottom until all the divers are safely on the bottom. Only once all the divers are safely down does the dive commence. When a diver runs low on air, at about 50 bar, they let their dive buddy know, and they also let the DM, who is leading the dive with the SMB know, and then they ascend up the buoy line. The skipper, on the boat above, follows the buoy, and as the divers ascend, and reach the surface, the skipper helps them back in the boat. Only once the last diver has run low on air, the last diver, and the Dive Master, ascend to the surface and get back into the boat. Once all the dive gear has been stowed, and fastened, does the skipper head back to shore. Quite organised. Is it possible to join sardine run tour without dive certification? I don’t have it. But I dived one time in open sea with master dive. Many thanks for submitting your request regarding the Sardine Run via the “Contact us” submission form on Dive The Big 5’s Website. To answer your question: You definitely can join the Sardine Run without being a certified Open Water Diver. All it means is that you can get into the water whenever there is “Sardine action,” and view the proceedings with a snorkel, mask and fins from the surface of the ocean. In fact, this is what most divers do, as the action is always on the move, and the people on the boat, who are certified divers, don’t have time to put on all their dive gear, and get into the water, before all the action has passed. It’s only when, and if, you happen onto a bait-ball, is there time to put on all your dive gear, get into the water, and drop down to 10 or 15 meters, to view all the action of the sharks and dolphins feeding off the bait ball. If this does happen, you can also see all the action from above, on snorkel. It’s sometimes better having a “birds eye view” from above, than being 10 / 15 meters below. Please go to our Website https://www.divethebig5.co.za/2017-sardine-run.html to get dates, rates and locations of all the Sardine Run Expeditions that we offer, and then click on the location and date of your choice to see the day-by-day itinerary you have chosen:- <a href="https://www.divethebig5.co.za/2017-sardine-run-out-of-east-london.html <a href="https://www.divethebig5.co.za/2017-sardine-run-mpame.html Please don’t hesitate to contact us should you require any further information. I have clients – a couple, who would like to participate in coral reef diving. 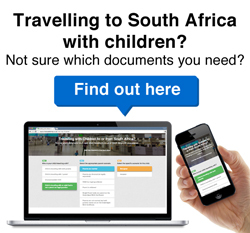 Based on what I’ve read on your site, it seems that Cape Town is not really advisable for them. They have asked me to source an operator who can facilitate this for them on their trip here in August. Their request to me – “The second priority is to have an instructor just for us. Does it make a difference to the diving schools that although we do not have qualifications, we are not complete beginners, as we have done four open sea dives (S. Africa (one-day introductory course and reef dive, Australia (two on Great Barrier Reef) and Florida).” Please advise what you would recommend for them and whether you would be able to assist with activity for them. Many thanks for the below e-mail. I really don’t think anyone will be able to help your clients, as in order to dive in South Africa, a would be diver must be certified as a OW1 diver, which is the minimum requirement. Some very “tame” overseas dive sites, like the sites mentioned in your mail, The Great Barrier Reef and The Florida Keys, offer “discover scuba,” I day courses, where you go to a very shallow reef, with a personalised instructor, and are able to scuba dive the reef with the instructor. Not here. All our reefs are at least 2 Miles out to sea, and the shallowest is about 6 meters. Plus, the sea’s and surf are extremely rough and testing, plus there are currents and surge to contend with, compared to The Great Barrier Reef and Pennekamp State Park in the Florida Keys, which have none of the afore mentioned. The latter are like a swimming pool. Flat, no current, no waves, no surge, and as they say over there – “Guys the pool is open, jump in, enjoy.” Vastly different to our local conditions! I really don’t think you will come right anywhere in South Africa. Please let me know if you do? I'm looking into options for tours combining safari and diving in South Africa, for up to two weeks, this September (2018). Do you have any relevant tours planned? All the tours I saw had dates for August and October. Many thanks for visiting our website and for asking your most intriguing question: “Why do sharks eat fish”I’ve been in this business 20+ years, and this is the first time I have been asked this. Well done! Do I get a prize if I answer it correctly? The answer, I guess, is the same reason why lions eat meat. Or, why Zebra & Buffalo eat grass. And if you think of it, why giraffe eat leaves! I guess they like the taste, I like shrimp, I like spinach, and I like “grass”! Hope I’ve answered your question satisfactorily. Please mail the winner’s check. There are a few privately owned yachts that operate out of the Bazaruto Archipelago and from Pemba as live-aboards, servicing the Quirimbas, Bassas da India, St Lazarus Banks, and Comoros. These are available for private charter when not being used by the owners. These are 6, 8, and 12 berth catamarans and schooners, that go out on a 7 to 10-day charter. Due to the limited number of berths on each vessel, the entire yacht is normally charted out to groups, who charter the vessel exclusively. Individuals, couples, and small groups can book a trip with the hope that others will also book on the same trip, thereby filling all berths. Should this not be the case the group who have booked must either charter the entire vessel themselves or cancel. We have never, in our 20-odd years of existence, been successful in booking a yacht, based on a “fill-up” charter! Again, as with shore-based diving, all diving off a yacht is limited to two or 3 dives a day, which are usually done one hour before high/low tide to one hour after the high/low tide. This is due to the depth of the reefs and the 3-meter difference between high water and low water, which results in a 4 to 5 knot current in between high and low tide. Not pleasant diving! Due to the remoteness of the dive sites, and the distance from civilization, medical attention is limited to the basic first aid knowledge of the yacht's crew, with the nearest re-compression chamber being a helicopter flight of thousands of k’s, with a result, “pushing the limits”, multiple deep dives, and technical dives are not permitted. This is recreational diving at its best, but very regulated and controlled.